This was a fantastic novel about youth, travel and most importantly, the shared love between two friends. In this, we follow Amir's journey as he tries to right his wrongs from childhood. I started reading this on a 3 hour train journey and ended up finishing it that evening! I was hooked the entire way through reading this. My favourite factor was the characters because they felt very real to me. Hassan is so innocent and caring while Amir is determined and broken. The two of them together have such a strong bond that's almost unbreakable. The plot line was extremely powerful. There was foreshadowing to the events and when I finally discovered these I was shocked. They were heartbreaking. Amir's actions were unforgivable however I was pleased that he spent the rest of the novel trying to fix his mistakes. 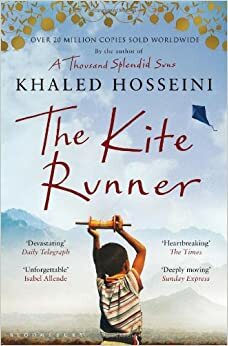 Hosseini's use of imagery provides a realistic element to this novel. He has a moving way of describing the settings, characters and their actions. Everything flows really well and it was a pleasure to read. The cultural aspects were fascinating since I knew little about the lifestyle here in Afghanistan. This is definitely worth a read if you're interested in learning about new cultures and friendship. There is constant intrigue and mystery running through this, as well as the powerful and devastating consequences.